When it comes to spectacle lenses for children, impact resistance remains key. As a result, optician Vincent Afrouzi, owner of Vincent Optical in Kitchener, ON, notes that the vast majority of lenses he dispenses to pediatric clients are either polycarbonate or Trivex, as both materials are known for their durability. 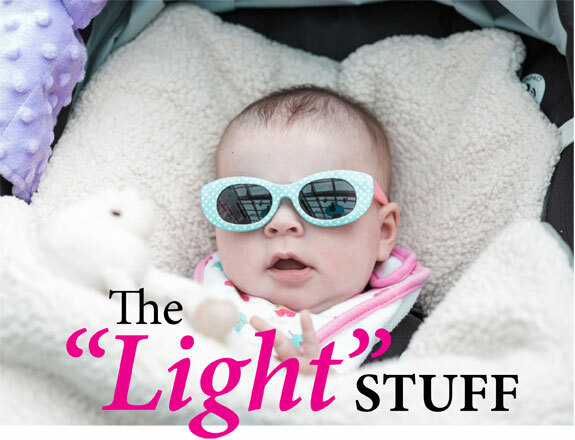 However, in recent years, exposure of young eyes to light radiation – including ultraviolet (UV) light – has emerged as another optical safety concern for kids, leading to a greater emphasis on spectacle lenses and lens treatments designed to address these concerns. In fact, Madelaine Petrin, an optician and professor in the opticianry program at Toronto’s Seneca College, says that the issue of eye protection from harmful light rays for children has become a major focus of her teaching. In a paper published in 2011 in the journal Progress in Biophysics and Molecular Biology, Swedish ophthalmologist Per G. Sõderberg, notes that there are, in fact, three forms of light radiation that have potential adverse effects on ocular health – UV, visible light (i.e., blue) and infrared. Although the sun remains the primary source for all three, increased use of lasers and infrared technology in everything from computers and video games to remote controls has led to an added risk for exposure. Researchers first recognized that UV, visible and infrared light had the potential to damage the retinas or the crystalline lenses of young eyes in the early 1980s; however, more recent studies have indicated that the eyes of children between the ages of three and 15 are the most vulnerable to the harmful effects of light rays, and that exposure at a young age can lead to ocular diseases such as cataracts and macular degeneration later on in life. Findings such as these have led educators like Petrin to emphasize the importance of high-quality plano sunlenses for children who do not need prescription eyewear or who opt for contact lenses. Because polycarbonate lenses feature built-in UV protection, most young children who wear prescription glasses have at least a baseline level of protection. According to Afrouzi, though a few of his pediatric clients opt for lenses made from other materials; for them, he says, UV coating is now a must. The optician also strongly recommends anti-reflective (AR) coating for school-age children, as the treatment can reduce glare from computer screens and handheld devices and it offers additional protection from harmful light rays. Sales of photochromics are also increasing among younger wearers because of their protective benefits. And some eyecare professionals have added various lens tints or filters to the eyewear of younger patients in an effort to provide added protection; however, it should be noted that experts debate the merits of some tint products. Eyecare professionals should research lens designs and tints before dispensing them.